There is such a magnanimous legacy attached to the Ambassador in our country isn’t it? 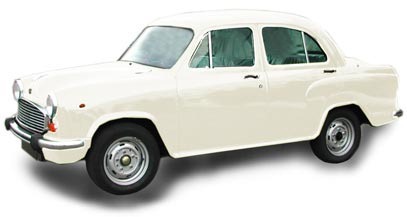 It was launched in India in 1958 by Hindustan Motor Limited and has been in production since with very few changes here and there. It is based on the Morris Oxford III model made by the Morris Motor Company in Oxford. Since it was probably the first big car in independent India it remained THE vehicle probably till the 80s. Not only a first mover advantage but also probably the only player in this space, Ambassador created a revolution for Indian vehicles. But then with the entrant of Maruti in India in 1981 and with the opening up of the economy in the 90s, Ambassador realised the competition it would face. And one thing for sure which has led to its decline is the inability to forecast the competition it would face. A failed attempt at exporting to the UK and also introducing few models like Avigo which is the latest one in 2004, today we see Ambassador’s only with the taxi wallahs and our politicians. Though it’s a very sad state of affairs, every product reaches a decline stage, doesn’t it? From what I see, Ambassador’s decline started over a decade ago and it has now reached very close to its death bed. Probably another 2-3 years at the maximum. Hindustan Motors has accumulated losses over the previous four fiscals wiping off half of its net worth. They also have a debt of 70 cr. Ambassador Sales have fallen from 3,000 units per month 12 years ago to less than 1000 a month today. And they say, they still want to innovate and bring out newer models to boost the ageing fleet. Now in my mind this is nothing but strategic inertia from an organization of letting go off its product. It reminds me off an analogy of Kodak which despite the coming in of digital imaging technology never let go off its film imaging technology. And look where it has landed them into? BANKRUPTCY! What has Hindustan Motors planned? They plan on launching certain new variants for targeting different customers through a partnership with Onio Design, a company from Pune. In the future they have also aimed at launching some new products based on the feedback from their customers. So why is Hindustan Motors going for an overhaul? They aim to increase the sales of Ambassador to 2,300 over the next 15-18 months or so through the launch and introduction of new variants of the car. And interestingly their move is mainly directed to the politicians and the IAS community of the country. I really wonder if that’s a competitive advantage for a automotive company in a country like India with newer vehicles coming every day. They also aim to increase the sales of its partner brand Mitsubishi which in my mind may be the only saving grace for Hindustan Motors. I have the utmost respect for Ambassador and what it has given to India. But I wish with the continuous competition in the market, Hindustan Motors realises that it has to think BEYOND Ambassador too. This seems like a FLAWED move! well said – does it really matter? I think with a lot of technological changes, Ambassador will beat any kind of compitition. I am not saying this out of delusion. Here are my two paisa. 2. It is the most spacious car until 4XW drives came along. 3. Even technically it has one of the best aerodynamic shape compared to some other cars with sharp striaght lines. 4. What I percieve as negetives for Ambassador is the engine which is old model and a gas guzzler. With latest technical advances, Ambassador can change the entire equipment / parts on the inside to make it one of the most fuel efficient. 5. Like UK Govt officially uses Rolls Royce for its staff and Germany its Mercedez and US its GM cars for all govt officials, with all technical modifications, Ambassador will best represent Indian officials proudly all around the world. All ministerial staff of central /state govts, all PSU officials will have to travel by Ambassador. It will be a best brand Ambassador for India. 7. If some enterprising businessman with national credentials (like Ambani) take over ambassador to have the car professioanlly designed and stuffed with latest technology / gadgets with out compromising on shape. Becasue the shape is everything to Ambassador. Infact Ambassador is what it is due to its shape. It can give sleepless nights to other cars. I think the points you have mentioned are really good. But then for a brand which has moved to the decline stage ALMOST, do you think its the right thing to innovate / change the design for such a car?